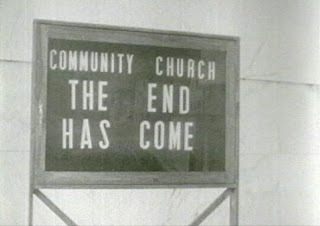 Screen capture from 1964's The Last Man on Earth. Thought for the day: "Sadness is an inevitable ubiquitous element of human life: we are beings who want to live in a world that constantly threatens us with death or that reminds us of death, if not literally then symbolically, through loss and aging and disappointment. And to me, a healthy life has to integrate sadness. Only by integrating sadness can we resist the temptations of fleeing from it in ways that are destructive to others or ourselves." - New York playwright Christopher Shinn, quoted by Cornel Bonca in "On A Clear Day: From Christopher Shinn's On the Mountain, Sophocles wavers in the distance," Orange County Weekly (1/13/05). I might not quite say it that way today but I think it's true. By denying life's inescapable sadness we do much more damage to ourselves and others than directly confronting and integrating that sadness could ever do. He is correct that sadness is a very natural and human emotion. It can prompt art and resurrect buried memories far more powerfully than any madeleine. When mixed with elements of popular culture, it becomes a curious and wonderful melange of memory and nostalgia. As John Cusack, playing Rob Gordon in 2000's High Fidelity, asked: "Did I listen to pop music because I was miserable? Or was I miserable because I listened to pop music?" As Shinn suggests, we ignore its presence in and effect on our lives at our peril. Six million American men will be diagnosed with depression this year. But millions more suffer silently, unaware that their problem has a name or unwilling to seek treatment. In a confessional culture in which Americans are increasingly obsessed with their health, it may seem clichéd—men are from Mars, women from Venus, and all that—to say that men tend not to take care of themselves and are reluctant to own up to mental illness. But the facts suggest that, well, men tend not to take care of themselves and are reluctant to own up to mental illness. Although depression is emotionally crippling and has numerous medical implications—some of them deadly—many men fail to recognize the symptoms. Instead of talking about their feelings, men may mask them with alcohol, drug abuse, gambling, anger or by becoming workaholics. And even when they do realize they have a problem, men often view asking for help as an admission of weakness, a betrayal of their male identities. But Shinn speaks not of the crippling and intrusive clinical depression of which Scelfo wrote. Rather, he writes of melancholy, the antonym of happiness. It is healthy to explore that facet of our lives, provided, of course that we eschew the sort of "woe is me" fashionable self-pity that became so popular (and hackneyed) in 1990s-era independent film and sitcoms (or, put another way, just the type of relics discussed and reviewed on this website). Site Updates: I have updated this site's sidebar to include a link to the Chronological Snobbery Mission Statement. Also, in "The Cultural Legacy of Ratt," I originally quoted from Steven C. Salaris's 1990 Usenet review of Ratt's Detonator album. I have updated that post to include a recent email from Salaris, now a Missouri parish priest, who offers his reflections on that 17 year old review. You might also investigate some of the comments to last week's post on Philip Hwang and Larry Nadolsky's 1986 Bruce Springsteen parody comic, Hey, Boss! The post appears to have drawn some comments from some artists associated with the late Todd Loren's Rock N' Roll Comics (which was influenced by Hwang and Nadolsky's work).